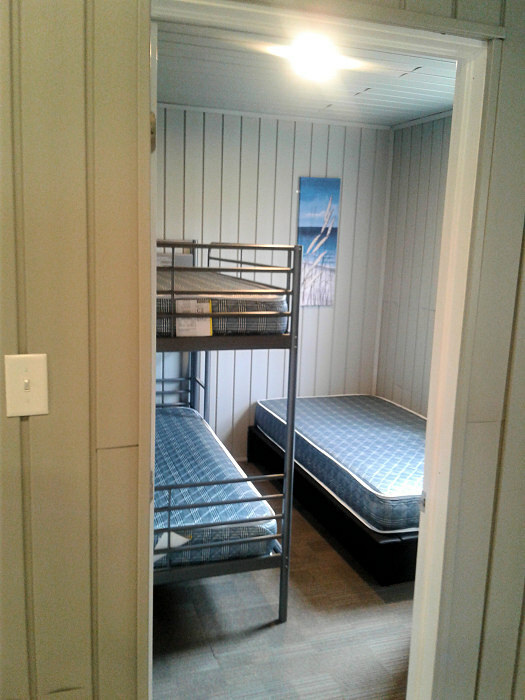 These roomy cabins have two bedrooms, a spacious full bathroom, and a kitchenette. 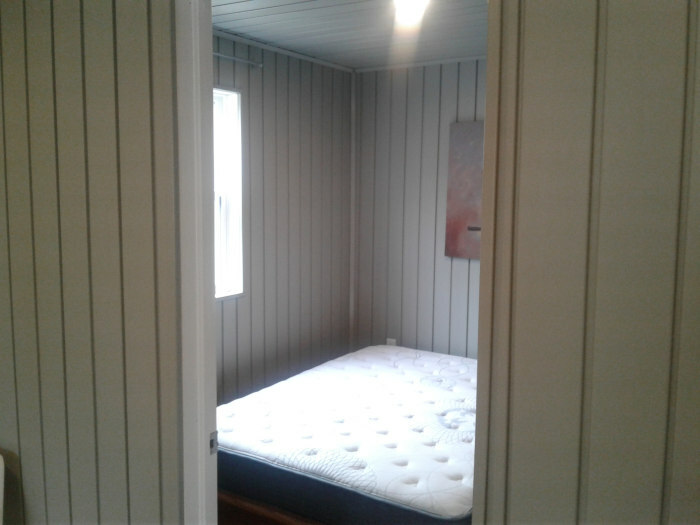 One bedroom contains a queen bed, and the second bedroom has a bunk and a single bed. 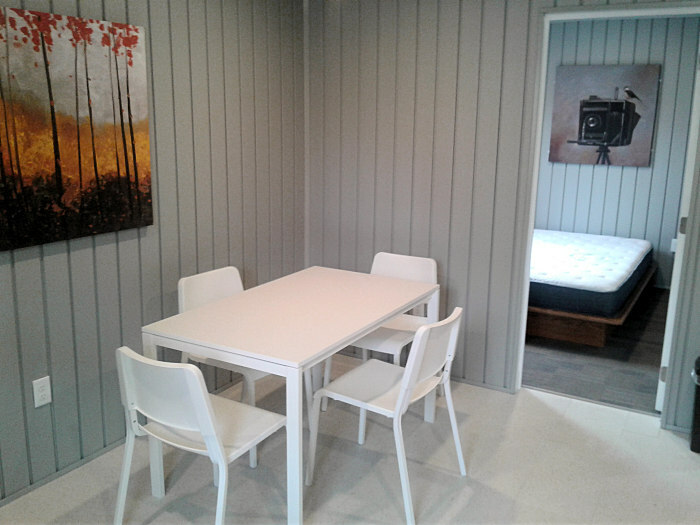 These cabins can accommodate a family of two adults and three children. You will want to bring your own linens and bedding. For evening entertainment there is a wall mounted TV and DVD player in the master bedroom. The cabins also include an air conditioner for additional comfort. 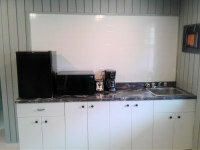 "The kitchenette includes a mini fridge, microwave, coffee pot, and toaster. There are some dishes, bowls, cups, and silverware stocked in the cupboards, as well as BBQ utensils. 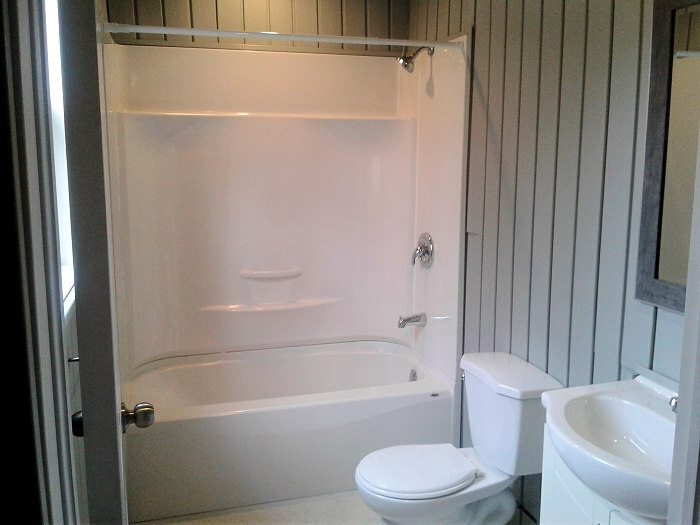 The outside boasts a 5 foot wide covered deck with a BBQ for your convenience. All of our sites have a firepit and a picnic table as well." South Mountain Park Cottages are conveniently located along a scenic paved secondary highway, in the Annapolis Valley of Nova Scotia. North of South Mountain Park Cottages is Kentville, New Minas and Wolfville which will have everything you need from farm markets, craft brew pubs, vineyards, and of course Walmart and Home Depot. The Bay of Fundy coast is located where you can see the highest recorded tides in the world at Halls Harbour (make sure to check out the Lobster Pound while there). New Ross Farm is just to the south of our cabins and cottages which is an old fashioned working farm. South Mountain Park Cottages offers two brand new cottages just opened in 2018. We also have a small rustic cabin placed along our pond with its own private deck. These cottages and cabins offer access to all the amenities at the campground including the swimming pool, which is the largest at any campground in the province, theme weekends, Jumping Pad, two outdoor playgrounds, an indoor playground, a giant slip and slide, splash pad, wagon ride, volleyball, tennis, soccer, paddle boats, walking trails, arcade area, laundry facilities, basketball, and daily children’s activities. Wow, that is a lot of family fun! Your cottage will have its own fire pit and picnic table. Each cabin comes with a BBQ under a covered deck area. 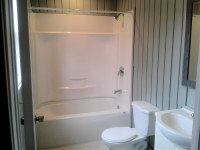 Every new cottage has an air conditioner installed for your comfort. 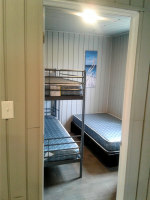 These cabins and cottage are in a secure gated campground. Our cottages have been renting out very well, and just like all our sites they tend to fill up quickly. Make sure to plan your cottage vacation early, and call well ahead to ensure that we have availability for your holiday. Cabins are a great way to enjoy the campground lifestyle if you are not in the market for a travel trailer or RV . Hotels are nice but cottages and cabins just come with so much more to do, and the opportunity to make great new friends. Summer is too short, do not let it go by without getting in some much needed outdoor time. The kids will thank you for going somewhere the whole family can enjoy. We look forward to seeing you at South Mountain Park Cottages in the beautiful Annapolis Valley of Nova Scotia.